Growing up I had fond memories of finishing my homework at the living room coffee table and watching television with my father at the end of a long weekend. More times than not, he would doze off by the time I finished my work and would patiently wait for him to wake up. This was my pastime of choice because whenever he came to, he would either take me to Dairy Queen or we would ransack the fridge for all of the cookie dough my mother obviously needed for something pure and innocent like a bake sale or feeding an orphanage. Sundays were the best because these moments of bonding stick out as invaluable to me to this day (and I realized that even though it signified I was but a night’s rest away from going back to putting up with the insufferable misery that was a third grade curriculum that consisted of learning your times tables, reading Sarah, Plain and Tall and finding out that not only does your crush, Kari, not like Dragon Ball Z as much as you did, she also thought you were a weirdo for rocking a mullet you wouldn’t get cut off because you would scream and climb up into the ceiling when your parents tried taking you to a barber). What was the best part of these Sundays bar none was watching cable action flicks on TNT as we ate. Back in the early 2000s, these films were the cream of the crop of the most cliche and awesome cop movies- Lethal Weapon, Cobra, Rush Hour (you know the ones). You could see where these ones are going from a mile away- there’s a new hotshot rookie cop who partners with the edgiest of the edgelord veterans who carries around a photograph of his (family/partner/LAN party buddy) that was brutally taken out by (insert bad guy here). The vet butts heads with the top brass frequently and is always the one to help the promising young mind back up when the bad guy bests them for the first time. Somewhere along the way, the two cops clash and don’t see eye to eye and the chief does the classic “you’re out of control (last name)!” to send off the veteran cop. The two get back together and either compromise or just flat out demolish the bad guy with some good ol’ capital judgement and the credits roll showing the same poorly chosen “action font” every one of those films had. If you’re getting salty that I didn’t put a spoiler warning up for all of that, don’t blame me just because Psycho-Pass drank from that Kool-Aid so well. This is absolutely not a bad thing because no matter how predictable a traditional cop story goes, it is just as satisfying as the tried and true western genre. 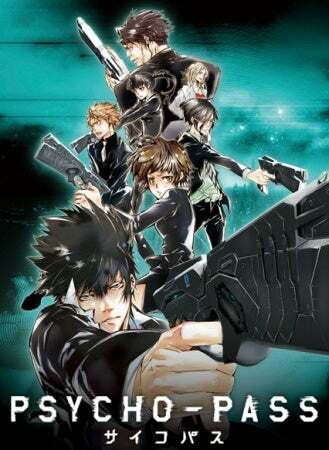 Following the story of a brand new police officer named Akane Tsunemori (such wasted potential for the ultimate tsundere with a last name like that) and her “Enforcer” partner Shinya Kougami (whose English VA, Robert McCollum, does the best impersonation of the grizzled cop voice perfectly) this wild futuristic series is a pure adrenaline ride through a pretty gritty civil justice system. Chances are you’ve already seen this series and it didn’t take you four years to watch it like myself, but this has been the first of many anime I’ve seen this year that I was holding out on and was just wrong with an initial perception (seeing as my last article had that entire idea as the thesis, I probably need to learn to evaluate my first impressions on anime better). My biggest hold up ended up being mostly true in that it was pretty easy to tell where this series was going as the story unfolded (really, the bad guy in Shougo Makishima felt like ideologies were taken from some teen’s Facebook rants about society), but what caught me by surprise was just how well everything was executed. The chases were bloody and tense, most of the criminals felt fittingly unsettling, and the music was phenomenal. There were a few twists that really managed to bring the most out of the familiar structure and play it out to a slightly different reading of the piece. Between the cheesy plot-lines and entertaining action scenes, the most fitting word that describes Psycho-Pass is simply just fun. Like any anime, it has flaws that people can (and will) go on about for all time. This doesn’t feel important, however, as there is a ton of potential for a satisfying rewatch of the 22 episode show, and I wouldn’t be surprised if I give it another whirl next year or the year after. Like those movies I had already seen twice or three times with my father, this show is perfect for anyone looking to just take in a good crime show. Happy Birthday Dad, thanks for always reading these after those long fourteen hour days even though you never watch anime or have any idea what I’m talking about. The effort is really appreciated, and I love you with all my heart. You and Mom are my heroes for how much you support and gloat about a wannabe writer like me.